Beach Wedding Orange Beach: Write Great Vows! 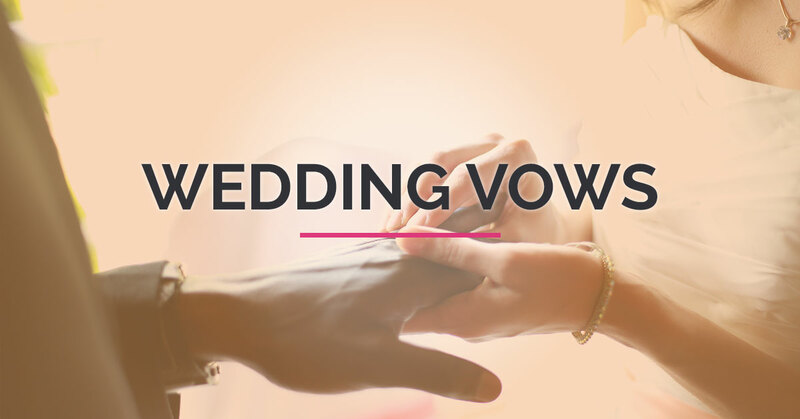 Vows are an extremely important part of any wedding ceremony, and are a chance for you and your future spouse to convey your deepest love for one another. Vows are often an element of your ceremony that guests really remember, and that you and your spouse will treasure. But with the busyness of wedding planning, vows oftentimes get left to the last minute and written in a rush. If you are planning a wedding, read on for some great tips on how to write the perfect vows for your ceremony. You don’t need to write your vows the day after you get engaged, but don’t wait until the last minute to put your thoughts on paper. Jotting down things you love about your spouse as you think of them can be helpful when you finally sit down to write your vows. If you keep a journal or diary, looking back through your memories can also give you great content and remind you of all of the special times you have shared. Ease the stress of the final weeks and days leading up to your wedding by getting a jumpstart on your vows. If you are a procrastinator you know that you could easily end up writing for hours the night before your wedding, and no one needs that last minute stress. Give yourself ample time to write your vows-they are important! Remember that you will be reading these vows out loud in front of friends and family. This is the time to be genuine and heartfelt, but you don’t have to disclose all of your personal details. This is not the time to dwell on all the fights you have had throughout your relationship, or how you almost married your spouse’s best friend. Recount your strengths as a couple, and reaffirm your love for your partner. If there are any specific promises that you know will be reassuring for your spouse to hear, now is the time to publicly proclaim them. Maybe you have been shying away from reading other couple’s examples of vows because you are afraid of copying anyone else’s style and want your vows to be unique. Don’t be afraid to read lots of examples before you write your own vows, they can help you get ideas and inspiration! If your wedding will be very traditional you may want to read examples from your faith or tradition to get an idea of what is expected. If you find vows that you really love, try to figure out the similarities between them, and create your own with those features incorporated. Reading a lot of other vows can really help you to form your own, and give you the push you need if you are feeling stuck. Many couples resist checking in with each other before the wedding concerning their vows because they don’t want to ruin the surprise of the moment. It is great to be surprised come vow time, but only if it is in a good way! If you share funny, sarcastic stories ending in a shouted “YOLO”, it may be embarrassing if your fiancé follows up with a tear-laden, heavily emotional speech. Coordinating at least the tone of your vows can help them work together, and give more of a flow to your ceremony. Do you want to make the same promises to each other, or get creative in your text? Having some collaboration in this area can make writing and reading your vows a little easier. Yes, we know you could write a novel about how deep your love runs for your fiancé. Wedding vow time is not the place to share that entire novel, and you should probably shoot more for a summary. Vows are extremely important, but they are just one part of a continuous ceremony that you want everyone to enjoy. Identify the most important points you want to convey, and focus on those. A general guideline would be one to two minutes, and if yours is more like a sermon you may need to make some edits. If you do have a lot of meaningful material about your future spouse, it may be sweet to make it into a letter for a future anniversary. Yep, for real. If you never say the lines out loud they may sound robotic or halting when you finally get to deliver them. You want to make sure your written words flow naturally when they are spoken, and practicing out loud is the only way to do this. Listening to your words will help you identify any awkward spots or pauses, and help you to memorize your lines if you are wanting to ditch the cue cards. This is a great time to also imagine how you will stand and gesture when you are up in front of a large audience and facing your soon to be spouse. The more you practice, the less nervous you will be, giving you greater confidence to deliver your vows clearly and powerfully. You only get to say them once, so practice makes perfect! You may have an old copy of your vows, filled with notes, crossed out portions, and revisions. Don’t bring this one with you to the ceremony. You want a clean, legible copy that will be easy to read when your big moment comes. Another very important thing to note is that wedding photographers often capture a shot of the vows, and you don’t want your coffee-stained, crumbled draft to be the star of the photo. A nice notecard, or even a small book, make for a great photo, and can become a good keepsake as well. You have crafted the perfect words, conveyed every emotion you wanted, practiced, memorized and are in love with your vows—you should still have a person in place who can read your vows if you can’t. The emotion of the day overcomes many people, and they become so choked up they are unable to get the words out. If this happens to you, it is great when someone is able to quickly step up and fill in for you, rather than having awkward moments of scrambling to get the vows read. Even if the backup remains just a backup, the peace of mind that you have someone in place may give you the confidence to finish your lines. If you shed a few tears, that’s fine! It is an emotional day, and everyone will be reaching for the tissues at some point. Your wedding day is filled with many details, and the vows are just one item you need to get in order. If you are wanting to make the rest of the day a little less stressful, consider a beach wedding with Beach Weddings Alabama! Our beautiful beach weddings in Orange Beach provide the perfect backdrop for a fabulous and unique ceremony. Our all-inclusive packages can really ease the stress of your big day. We can take care of the beautiful beach venue, arrange for flowers, decorations, food, and even the cake. But we will leave the vow-writing to you, and with these tips—you’ve got this!